In this article I want to look closely on the matter of different perspectives and how our own perspective shapes what seems right and wrong. Seeing something from a different perspective can raise your own awareness and enable you to find better solutions, especially if you have a lot of arguments with other people within your work or private life. My Perspective, is it real? The reason of the argument is that the other person has a different perspective on things. He is looking through his pair of glasses to the world, as well as we all do. This means that we filter everything by our personal history, our beliefs, motivations and concepts that we hold true. But it is important to know that they are not necessarily true for other people. What seems to me true can be wrong for a person that has a different personal history. And if this person disagrees with me and if I would be in his shoes now, I would probably disagree with the current me too. I have encountered many examples where different perspectives just collide with each other, especially in my work. It usually is not a discussion about right or wrong, or black or white. Mostly it is more complicated. Seen from different perspectives an action seems to be desirable but on the other hand also dangerous and possibly destructive. Both sides usually have their points. So you have to find the sum of all perspectives and then operate within it to find a suitable solution. A simple example would be to add advertising to a website. The user doesn’t seem to like it, but can he accept it? The website-owner needs to pay the traffic and want to make some extra money for his efforts. But can he also overdo it? Either perspective doesn’t supply a perfect solution, but taking both perspectives into account enables the solution of moderate advertising. Often we are afraid that seeing the other perspective then could lead to us losing the argument … or worse, to get a disadvantage. But the true value of another perspective lies within seeing more of a situation and therefore being able to make a better judgment for ourselves. And not only for ourselves but for the other person too. The key is often to include the perspective of the other person (which is also the essence of thinking win/win, a win situation for both parties). It can lead to true solutions instead of compromises. I remember the interesting story of Stephen Covey who had a friend who said that going for win/win is dangerous because you can be taken advantage of. He continued with his negotiating example and how he did not get the best deal. Covey struck him with the question “Why did you go for lose/win?” As it dawned to him that he did not go for win/win but really lose/win, it was like a revelation for him. So it can take some courage to see the perspective of the other person, acknowledge it and then look for the best solution for both. It requires the discipline to show the perspective to the other person too and to go for this win/win solution. The best way to do this is by empathic listening. This means that you listen to the other person and try to see the world as he/she sees it. This does not mean that you give up your perspective. It means that you add another viewpoint. If this corrects your viewpoint a bit, then this is nothing to be afraid of. On the contrary, it is great: you just got a more correct picture of the issue. You have to switch sides then and the other person has to listen to you. Again, Stephen Covey describes it on his book “7 habits of highly effective people ” as habit 5: Seek first to understand, then to be understood. If you are for your own, maybe you see something on television, you can also expand your perspective and try to see the world through the eyes of other people first, before judging them. This sounds easier than it is. Only if you can understand the actions of others, if you can feel their motives within you, you can truly say that you see their perspective. Otherwise there is a certain amount of ignorance, which ultimately means that there is a too narrow perspective. Of course, feeling their motives doesn’t mean to agree with them, but to understand them. The process of personal growth is also the process of broadening your own perspective. It is the process of becoming aware of deeper principles and of including more than our own ego into our perspective. In the great movie Dead Poets Society (see the “Carpe diem” part at Youtube ) there is the teacher Mr. Keating encouraging the students to climb on the table to look at the class-room from a new perspective. It indeed looks different from up there. If you get a bigger picture you get a perspective that is able to solve a situation that seemed unsolvable first. Albert Einstein said “Problems cannot be solved by the same level of thinking that created them.” This is very true with perspectives. If you look at the current problems of even wars, of course both sides think they are on the right side. From their perspective their actions are totally logical and the right thing to do. But it is a too narrow perspective. If both sides would be able to broaden their perspective and realize that humanity does not end at the border of their own country, that at the core we are all the same and seeking happiness no matter where we are, then this would be the first step to get sane again. Real solutions get in a range of possibility again. You may say “but it is not that easy”, well then broaden your perspective. If you look at planet earth from space and you see two countries at war, would you say this is the right thing to do? If no, then you found a perspective that is broad and aware enough to find a better way. You can get to the details once the basic agreement has been made in the mind. To acknowledge and respect another persons perspective can only lead to a more positive outcome. This awareness may also lead to amazing self growth ~It also can be most effective when each party is practicing this at the same time~this is the difficult part ,which may never happen !We can only hope for the best, when you don’t have any control over certain things ! Understanding the perspectives of others was something I took some time to learn. Especially when you are younger, you tend to think only you are correct. But with maturity, most people learn to accept that their opinion is simply based on their perspective. Like looking at an object from one dimension. The other person will see a different side of the object and form a different opinion of it naturally. Great article. I enjoyed hearing your perspective, and I agree with you. There are quite a few different ways to go about things. 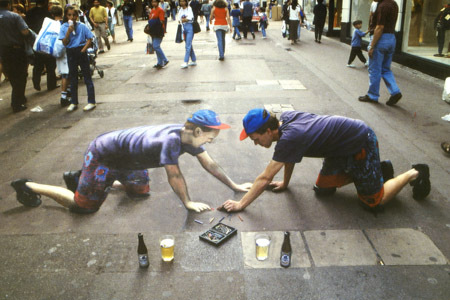 That photo courtesy of Julian Beever is really neat, I love those drawings where it looks so real when you look at it. Since failure is basically a feeling, I think that someone can fail in doing something and gain so much benefit from it that they don’t even consider it a failure, nor do they FEEL they’ve failed. So wouldn’t it be a matter of perspective? What do you consider failure to be? “If you change the way you look at things, the things you look at change.” -Wayne Dyer. That is truly an amazing and deep quote! Perception is key! I think we should always take what others say or do into consideration. They must have a reason for saying or acting in the way that they do. Once we understand that, we probably would think not in our view or their view, but a third person universal view. Too often, we think about ourselves and our own priorities, which lead us to biased opinions. Losing the argument is not a big deal if you come out as a bigger person. You have to realize that it’s not really about reputation, but more about character. If you are a good role model, people will eventually show respect for you and look up to you. Your reputation will completely change. It’s a much better feeling as well; knowing that you acted in the best you could and people praise you for it. I was just having this conversation with my mother the other day. Often times, people think about a situation and say that’s not fair and that’s not right. They tend to try and make it right in the most immoral ways. Life’s not fair! It’s not about equality. It’s about playing your role and doing your part. If others want to step on you, you don’t necessarily have to step on them back. You can’t fight fire with fire! There has to be an outside force, whether it’s wind or water. Good is always greater evil! Love will conquer hate! Light will overpower darkness! I was just telling my mother how I always admired the elder person in the movies, where this kid throws a rock at an old man’s house window. The old man would laugh because he was once that kid and he finds it amusing. He wouldn’t feel the need to set things straight and cause a war. The old man would actually wishes the best for the kid and that one day he’ll learn from his actions. You’re right! It all starts with discipline. It’s why I meditate! To discipline my mind because I think it’s one of the most important units in our body. I’m the type that loves an obstacle as well. That’s why I’m still a vegetarian today. I believe that perception and how you react to situations changes everything. How you choose to feel and act in relation to your environment is a matter of choice. I’m not saying it’s easy, but it all starts from within. Put yourself in someone else’s shoes and walk in them for a day! I wish I could lend my mind and eyes to another person sometimes. Since I’m not able to do that, I should learn to adjust my perception to see how they see. Seriously though, I think knowing about and trying to see different perspectives is a key to reach understanding with other people. As in your example it is possible to adapt then, to not only find a compromise but a synergy. One thing we forget in comparing our different perspectives is motive and intent. As a teenager I applied for a job with me local phone company. It required passing a test. On the day of the test, I showed up with about 50 other people, took my seat and followed the proctor’s instructions. When I went to the front of the room to turn it in, I noticed that everyone else was still bent over working on their tests. As I handed my completed test to the proctor she scored it quickly and muttered “Overqualified” and waved me to leave the room. Since that day long ago I’ve come to realize that what a person sees with the same facts depends on their motive and intent. While my quick completion of the test and high score might have won me acceptance in some settings, for the phone company it didn’t even earn me an interview. We can’t assume that all employers want the best and brightest, no matter what they say in their ads. I now understand their perspective. Someone too quick and sharp can be harder to manage, prone to inspire coworkers to invoke their rights, and not likely to take orders blindly. As for your example regarding placing ads on websites and blogs, I didn’t agree with that at one time. As I began to read and learn more about the blogosphere, however, I realized that certain ads instead of being intrusive were actually helpful for visitors seeking information. Besides, I also woke up to the fact that bills must be paid. That’s interesting, what is right and wrong? Ultimately it is the judgment we put on something. A thing may be right for me and wrong for you. The perspective is different, there are other personal histories, beliefs, values and goals. I judge it as wrong for me personally, but it is not wrong on a larger scale. If I change, I may judge it right later. The question seems to be, which perspective leads to happiness for me AND for all others? There are the actions that work smoothly and don’t generate to much resistance. I believed that there are indeed two perspectives for a very long time. I thought there was my perspective and the WRONG perspective. I now know that there is no right or wrong, there just IS. Great article, thanks! Excellent post. Thanks for the research and sharing of perspectives from Einstein to Covey to Mr. Keating. An enjoyable read and reminder to remain awake.